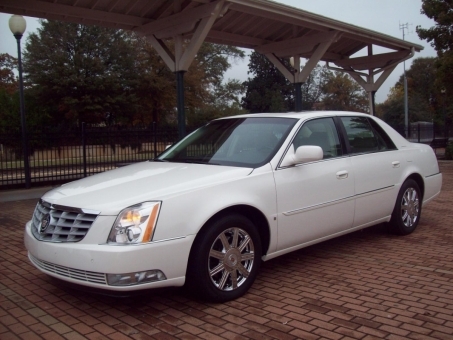 2008 CADILLAC DTS 6-PASSENGER 4-DOOR SEDAN...A LOCAL ONE-OWNER NORTH CAROLINA TITLED VEHICLE!!! This vehicle comes powered by a 4.6L V-8 Engine along with an Automatic Transmission. Colored in a White Finish -8554- over a Tan Leather Interior. Other options and features include: A/C w/ Dual Front and Rear Climate Control, Power Windows, Power Locks, Power Mirrors, Tilt Steering, Cruise Control, Rear Defroster, Keyless Remote Entry w/ Alarm, Factory BOSE Stereo w/ CD + Satellite Radio Ready, Dual Front and Side Airbags, Fog Lights, Dual Power Seats, Dual Heated and Cooled Seats, Driver Memory Seat, Dual Lighted Vanity Mirrors, Navigation, Bluetooth, OnStar, Homelink, Compass, Outside Temperature Meter, Traction Control + ABS, Wood Grain Interior Trim, Steering Wheel Controls, Center Console, Child Seat Anchors, Factory Carpet Mats, 17-inch Factory Chrome Wheels on matching Michelin Tires. This vehicle has NEVER been smoked in + books and owners' manuals are in the dash.